With each joint consisting of a male and female ferrule, Top Line T-I Line Fittings assure a positive seal and a rigid joint. 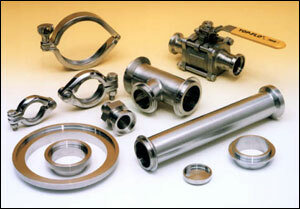 Available in sizes 1″ through 4″ in material types 304 and 316L stainless steel. Gasket material includes PTFE, Buna and Viton, with wing nut or bolted high-pressure clamps available out of inventory.